The Saving Our Students Youth Coalition of Anderson County received statewide recognition from the Kentucky Youth Empowerment System for their efforts to reduce youth alcohol, tobacco and illicit drug use. The Saving Our Students (S.O.S.) Youth Coalition of Anderson County was recognized as the 2017 KY Youth Empowerment System (Y.E.S.) Outstanding Achievement Award recipient by the KY Cabinet for Health and Family Services Department for Behavioral Health, Developmental and Intellectual Disabilities and the Bluegrass Prevention Center. 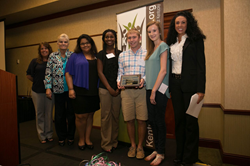 The youth group was honored for their community-based programs to prevent youth substance abuse yesterday, September 27, 2017, during the 10th Annual Kentucky Prevention Network State Conference in Lexington, KY. In addition to this state recognition, the Anderson County Youth Coalition will receive $250 in addition to their existing FY2018 Y.E.S. Grant for youth-led substance abuse prevention strategies in Anderson County. S.O.S. Youth Coalition envisions its community of Lawrenceburg, Anderson County, KY, to be an environment and culture for its youths of all ages that is free of alcohol, tobacco, and illicit drugs, and is achieving lasting results. Policy Work: These local youth led the effort to strengthen their school district’s tobacco policy to prohibit students and staff to use dip or chew tobacco products on school grounds. Positive Change: The youth coalition developed and presented a positive social norms campaign to more than 2000 youth in six (6) local schools with the clear message, the overwhelming majority of Anderson County youth are NOT using illegal drugs like marijuana or misusing narcotics/ Rx drugs without a doctor’s consent according to the 2016 Kentucky Incentives for Prevention (KIP) Survey by REACH of Louisville, Inc. The youth substance abuse prevention message developed by these young leaders reached an estimated 10,000 youth and adults. Youth coalition members established partnerships with 45 local and state organizations including the Kentucky Lt. Governor, Lawrenceburg Mayor, County Judge, Jailer and Attorney, Anderson County ASAP Board, Kentucky State Police officers and detectives, local organizations and clubs, parents who lost family members to drug overdosing, organizations in surrounding counties, drug recovery organizations, recovering drug addicts and their families, faith-based leaders, a nationally known youth substance abuse presenter/trainer, and others. For more information about the S.O.S. Youth Coalition of Anderson County contact Donna Drury at dcdruru@roadrunner.com or 502-517-1938. For more about the Youth Empowerment System (Y.E.S. ), please contact Tara McGuire at tkmcguire@bluegrass.org or 859-225-3296.